The Legend Course is home to the MCB Tour Championship, held each year in December and has been attended by golfers such as David Frost (RSA), Sam Torrance (SCO), Tom Lehman (USA) and Peter Fowler (AUS). Legend is a challenging 6,018 metre par 72 course designed by former South African champion Hugh Baiocchi. The greens provide the perfect putting surface having been rebuilt to USPGA specifications, turfed with Tif Dwarf grass. Each of the holes on the Legend course boasts superb fairways and distinctive characteristics. Set in the heart of an indigenous forest originally used to breed deer, the course embraces the natural beauty of its surroundings. The 18th hole (par 5) can prove a test for the nerves, with plenty of water down the dog-leg right and a green surrounded by a combination of bunkers and water – and in full view of the club house! The Links Course, designed by Rodney Wright and Peter Allis, is a challenging 5,942m, 18-hole, par 71 course. One of the locations for the MCB Tour Championship, the final stage of the European Senior Tour, the course becomes a real challenge in the wind with lots of water and the unique pyramids of volcanic rock that dot the edges of many of the fairways. Set amongst 213 hectares of tropical gardens and surrounded by a golf course designed by Ernie Els, Anahita The Resort is nestled on the East coast of Mauritius. The Anahita Golf Course in its exquisite natural setting, is both spectacular and challenging. Designed by Ernie Els, the course is a 6,828-meter, 18 hole, par-72 championship course with large fairways and five sets of tees. Six stunning ocean front holes culminate in a final shot that is among the most spectacular in the world. Built to USGA standards, it is the first of its kind in Mauritius. Carefully woven into the tropical sanctuary, the course is set against lush mountains and fringed by a vast crystal-clear lagoon. 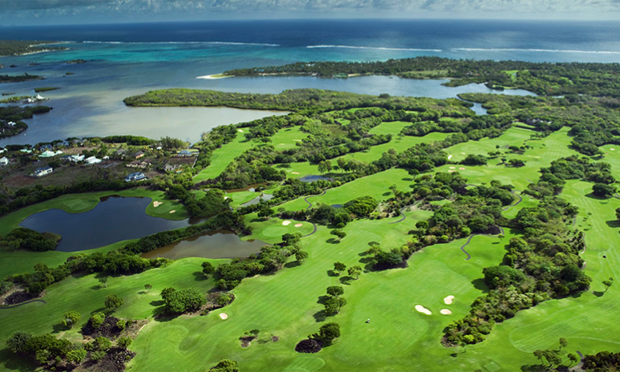 Le Touessrok Golf Course is set on Île aux Cerfs, located a few minutes by boat from Anahita The Resort. This "golf-island" is a 6,452m,18-hole Par 72 championship golf course, designed by the famous golf champion Bernhard Langer. 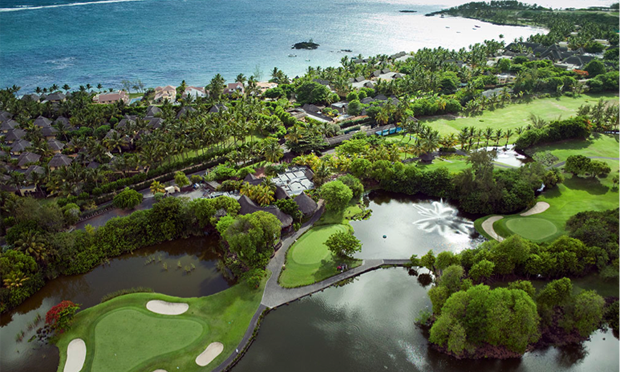 Le Touessrok Golf Course is accessible to players at all levels. Surrounded by the azure waters of the shallow lagoon and dotted with small lakes and ravines, golfers on the Île aux Cerfs play whilst surrounded by lush tropical vegetation. The Paradis Golf Course stretches between the natural boundaries of the historic Le Morne Mountain and one of the most beautiful lagoons in the Indian Ocean region. Beachcomber’s Paradis Hotel is home to an 18-hole, 5,899 metre, par 72 course. The ParadisGolf Clubhas the only golf course in Mauritius built within a resort’s grounds with the clubhouse and first tee located just 30 metres from reception. The course is a pleasure to play and offers a challenge to all standards of golfers. The golf course emphasises the site’s unique scenery and tropical feel. The front nine holes are played under the towering Le Mornemountain and feature a number of marina crossings. The back nine holes are spread along the coastline, treating players to a round of golf close to the beach, with spectacular views of the lagoon and mountain. The Club House is the perfect setting to relax before and after a round with showers, lockers, cart and club hire, a boutique and bar available. For those wanting to improve or practice their golf, the Paradis Golf Academy has a driving range, putting green, bunker and pitching practice areas. The resident professionals can assist with lessons and state-of-the-art video swing analysis. A short drive to the north of Paradis ,through the villages of Black River and Tamarin is the Tamarina Golf Club. Designed by Rodney Wright, this 18-hole Par 72 Championship course undulates over 43 hectares of rugged savannah landscape which traverses the Rempart River. The course is carved into the rugged south-west savannah land coast of Mauritius, between mountain and sea, and has an African feel with its abundance of beautiful Acacia’s (thorn trees).